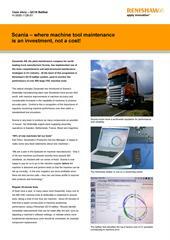 Renishaw.com - Resource centre - Case study: Scania - where machine tool maintenance is an investment, not a cost! Dynamate AB, the plant maintenance company for world leading truck manufacturer Scania, has implemented one of the most comprehensive and well-structured maintenance strategies in it's industry. At the heart of this programme is Renishaw's QC10 ballbar system.